It’s a Snotty Job, But Someone Has to Do it! Being a whale researcher is not always the most glamourous job. Often scientists have to get dirty in order to collect the data they need to better understand whale populations. A team of marine mammal researchers, including the Marine Mammal Research Program’s own Dr. Lance Barrett-Lennard, understand this all too well! They spent part of the summers of 2016 and 2017 collecting “snot” samples from humpback whales in order to monitor their health. Unlike humans, the respiratory tract of cetaceans (whales, dolphins and porpoises) is not connected to the mouth. When a cetacean breathes, it comes to the surface and releases the air within its lungs in what we commonly refer to as a blow. Blows contain microorganisms, such as bacteria, suspended in droplets of mucus- in other words, whale “snot”! As the exhaled breath only passes through the respiratory tract, the blows generally do not contain bacteria from the mouth. As in humans, the respiratory system is one of the first places cetaceans can get an infection or a disease. By collecting blow samples from a drone, researchers can monitor the health of humpback whale populations. With help from a hexacopter drone, the field team (Drs. John Durban, Holly Fearnbach, Michael Moore, and Lance Barrett-Lennard) collected blow samples from 26 humpback whales in Cape Cod, Massachusetts and near Vancouver Island, British Columbia. 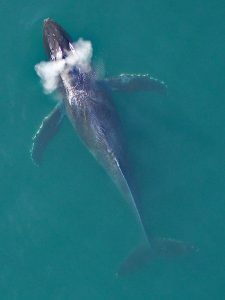 Samples were collected by flying the drone two to four metres above the whale’s blowhole, and collecting a blow sample when the whale exhaled. 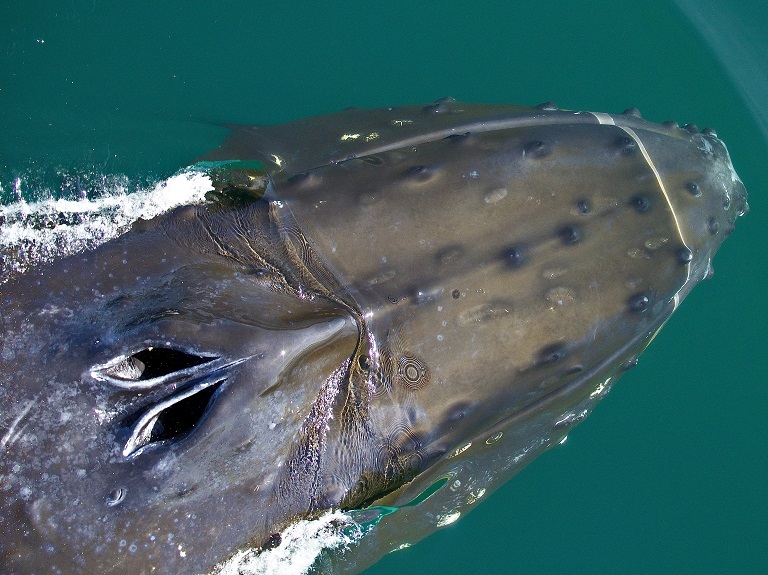 To avoid confounding results, samples of water were also collected from the sea surface nearby, to compare the composition of microorganisms found in humpback blows to those found in seawater. Blow and seawater samples were analyzed in the lab using DNA amplification and sequencing techniques to reveal the different microorganisms present. Back in the lab at the Woods Hole Oceanographic Institute, Dr. Amy Apprill used DNA analysis to identify the microorganisms present in both the blow and sea water samples. Both contained a rich and diverse assemblage of microorganisms. The blows contained 15 phyla of Bacteria and two phyla of Archaea. Several of these phyla were also found in the seawater samples, but some classes were not present. Blow samples were 50 to 90% similar between individuals, with 36% of the community of microorganisms being found in all individuals. Because of this consistency, the research team suspects that whales acquire nutritional and/or immune benefits from hosting this specific community of bacteria. No respiratory pathogens were detected in any of the blow samples. Next on the agenda for the team is to study the microorganisms in unhealthy or diseased whales to compare how microorganism composition changes with health. Photogrammetry (measurements from photos) from images taken by the drone will be used to determine the body condition and health of invidiuals. Looks like the scientists will be getting dirty again! Apprill A, Miller CA, Moore MJ, Durban JW, Fearnbach H, Barrett-Lennard LG. 2017. Extensive core microbiome in drone-captured whale blow supports a framework for health monitoring. mSystems 2:e00119-17.